Cooler weather has the crappie biting on Lake Okeechobee. Live minnows and jigs around outside grass lines have been producing well, look for clean water and fish 3-4 feet down. 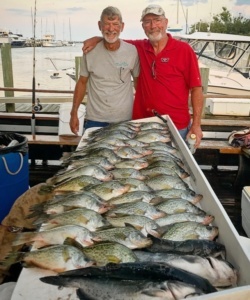 Drifting live minnows around the mouth of the Kissimmee river has also produced some good numbers of Crappie. Water temperature is 70-72 degrees. If your looking to get away from the cold and enjoy the beautiful Florida sunshine be sure CLICK HERE to book your trip today.